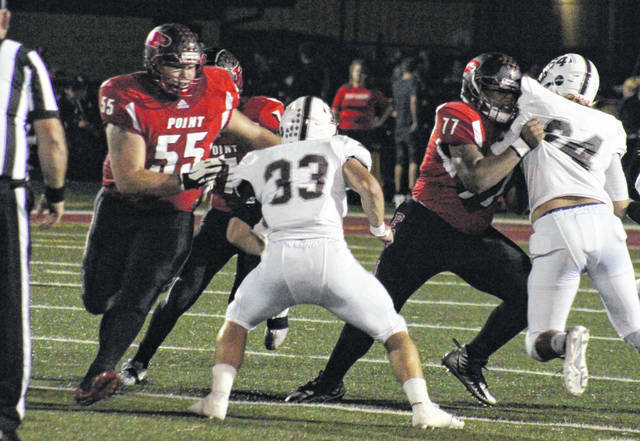 PPHS offensive linemen Jacob Muncy (55) and Trevon Franklin (77) provide a pair of blocks, during the Big Blacks’ win over Pikeville on Sept. 21 in Point Pleasant, W.Va.
Last Game: Point Pleasant defeated Pikeville 41-34, in Point Pleasant; Meigs lost to Athens 50-20, in Rocksprings. Last meeting between the teams: Oct. 13, 2017. Point Pleasant won 56-16 in Point Pleasant. PPHS offense last game: 271 rushing yards, 167 passing yards. MHS offense last week: 31 rushing yards, 289 passing yards. PPHS offensive leaders last game: QB Cason Payne 19-of-26, 167 yards; RB Cason Payne 13 carries, 88 yards, 4TDs; WR Josh Wamsley 8 receptions, 89 yards. MHS offensive leaders last week: QB Coulter Cleland 21-of-34, 289 yards, 2TDs, 2INTs; RB Zach Bartrum 6 carries, 17 yards; WR Zach Bartrum 6 receptions, 117 yards. PPHS defense last game: 166 rushing yards, 337 passing yards. MHS defense last week: 253 rushing yards, 147 passing yards. 1. In all-time meetings, Point Pleasant holds a 15-5-1 record against Meigs. Point Pleasant hasn’t played in Meigs County since defeating the Marauders 16-14 in 2007. 2. PPHS is coming off back-to-back bye weeks, after a seven-point victory over Pikeville. It was Point Pleasant’s second seven-point win of the year. Meigs fell by 30 points last Friday, its greatest margin of defeat since falling to the Big Blacks last season. 3. Through five games, PPHS has outgained opponents by a 2,411-to-1,367 in total offense, including 1,737-to-492 on the ground. PPHS is even in the turnover battle this season, with five giveaways and five takeaways. 4. Through seven games, Meigs has gained 1,568 of its 2,211 yards through the air. The Marauders’ seven opponents have combined for 2,479 yards, including 1,566 on the ground. MHS is minus-8 in the turnover battle this fall. 5. PPHS is currently sixth in the WVSSAC Class AA rankings. The Big Blacks are joined by Fairmont Senior, Bluefield, Nicholas County and Bluefield as undefeated teams in the class. The Marauders enter the week as 18th in the OHSAA Region 15 rankings, and one 15 sub-.500 teams in the region. Last Game: Hannan lost to Van 35-8, in Ashton; Montcalm lost to River View 30-12, in Montcalm. Last meeting between the teams: Aug. 26, 2016. Montcalm won 20-14 in Montcalm. Current head-to-head streak: Montcalm has won 10 straight. MHS offensive leaders last week: QB Doug Belcher 15-of-33, 201 yards, 2TDs; RB Christian Carper 6 carries, 30 yards; WR Christian Carper 7 receptions, 105 yards, 1TD. 1. The last time HHS visited Montcalm was Aug. 26, 2016, and resulted in a 20-14 MHS victory. The Wildcats are 4-13 all-time against the Generals, with the series beginning in 1995. 2. Hannan last defeated the Generals on October 26, 2007, by a 12-6 final in Ashton. Since then MHS has outscored the Wildcats by a 336-to-77 count. 3. Montcalm has scored in each of its six games this season, but hasn’t found the end zone more than twice in any game. All-6 of the Generals’ opponents have scored at least 26 points. 4. Van is the lone common opponent between these teams to this point in the season. MHS dropped a 40-6 decision at Van on Sept. 28, while Hannan lost to a visiting VHS squad in Week 5 in Ashton. 5. These teams enter Week 8 tied for 39th in the Class A playoff rankings. Along with Hannan and Montcalm, Buffalo, East Hardy and Valley Fayette are winless Class A teams.